Best Value Shed - Whitener's Backyard Outfitters Whitener's Backyard Outfitters © 2014. All Rights Reserved. The best storage buildings in the Chattanooga Area. The Best Value Shed is a great solution for those seeking a quality metal storage shed at an outstanding value. 8′ wide Best Value Sheds come standard with a single metal door. 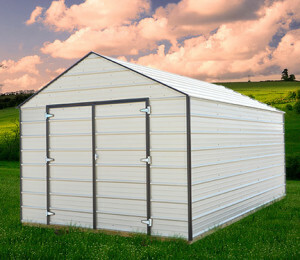 10′ + wide sheds come with double metal doors (shown). All best value sheds are built with Light Stone Metal and Brown Trim. Whitener's Backyard Outfitters © 2014. All Rights Reserved. Whitener's Backyard Outfitters © 2014. All Rights Reserved. The best storage buildings in the Chattanooga Area.